An office suite is regarded as an essential part of your daily work toolkit, whether you’re a big business or a retired individual wanting to keep on top of daily tasks. So you want to make the right choice, without spending a huge amount of money. Although it’s too easy to subscribe to Office 365 and use the suite across devices, we sometimes wonder if we really need the functionality? Do you use your word processor for more than a few essential documents or your spreadsheet to manage basic finances? If not, you might as well take a second look at the free LibreOffice. 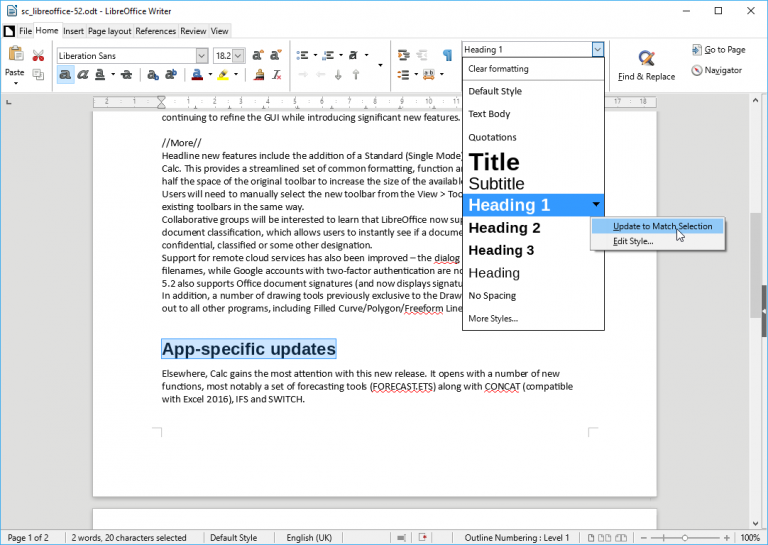 LibreOffice 6.1 is here and, although The Document Foundation announced this as a 'major release' new features are limited. First and foremost you’ll notice two new icon themes. Colibre is now the default for the Windows version of LibreOffice and was designed based around Microsoft’s icon guidelines. New icons aside, we’re still unsure why LibreOffice looks like it was designed for Windows Vista -- the UI hasn’t progressed in years and is one of the most disappointing aspects of the suite in our opinion. The latest 6.1 receives a reworked image handling engine, making the suite significantly faster and smoother, according to the developers. An improved graphic manager will make loading documents in the Microsoft proprietary format more swift. There’s a new Page menu and the Draw menus have been reorganized. Writer’s EPUB export filter has been given a boost with better link, table image and font embedding, so it’s easier to create an ebook from existing documents. In Calc, it’s now easier to anchor your images to cells, with three new anchoring options including to a cell, as usual; to a cell with resizing when the cell size changes; and to a page. CSV files can now be used as an external source for cell data. The suite’s online help pages have been enriched with text and example files to detail the new features and make localization easier for future translation work. Finally, LibreOffice Online has had some significant improvements with changes to the user-interface and closer to the desktop version. Performance has improved, as well as security. Download LibreOffice 6.1 for 32-bit or 64-bit devices.